Have you never wanted to build a castle by the Nile River, or anywhere like it? I've honestly quite liked the idea over the years. 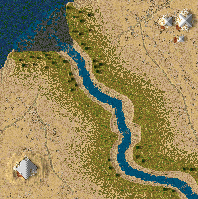 One of my first maps dealing with this was in Age of Empires II. I just think that it has such a history, that lush river in Egypt, that it is intriguing not only for its ancient history, but also for the violent history of the Mamluks, the Arabian caliphates, and of course the Crusaders. And now this map gives you an opportunity to make whatever suits your fancy. Relive the glories of the ancient Kingdom. Make a massive farming commune along the Nile. Quarry out the endless limestone deposits of the crumbling pyramids. (Hey, you wouldn't be the first! Alexander the Great built Alexandria out of the polished limestone that encased the original pyramids!) Skirmish with Nubians, Arabs, and Crusaders. Whatever you do, just enjoy this map and its lush river. And make the desert less barren, if you like.